Posted April 27, 2018 by Sage & filed under Media, Teaching, Yoga. 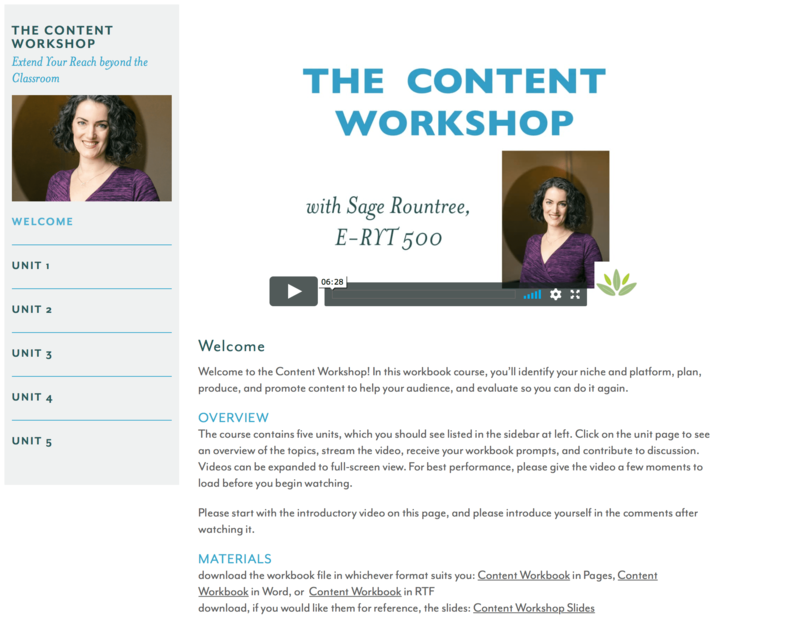 Meet the Content Workshop, the latest course at Sage Yoga Teacher Training! Ready to take your reach beyond the movement classroom? Do you have useful advice to share with your audience, but feel unsure about how to do it and where to start? In the Content Workshop, I show you how to share your gifts with the world by—yes—creating content. Whether your strength is in photography, podcasting, or writing, this workbook course will get you clear on planning, generating, and promoting your work. The course includes over an hour of lecture, a workbook, and plenty of resources to guide you toward creating whatever content you are excited about. This course is a sister to the Workshop Workshop, another workbook course that walks you through conceiving, creating, placing, teaching, and evaluating movement workshops. Now through May 31, the code SRWORKSHOP will get you $10 off either the Content Workshop or the already-discounted bundle of the Workshop Workshop and the Content Workshop. Click here to read more and to get started on the course!